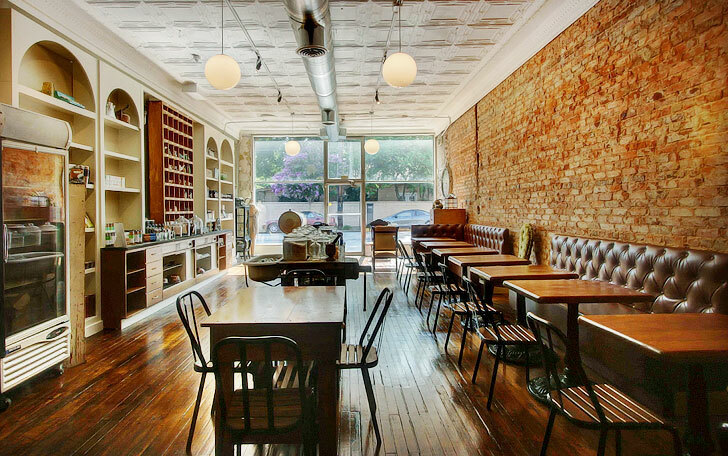 Tipple + Rose Tea Parlor and Apothecary is quietly nestled in the bustling Virginia Highland neighborhood of metro Atlanta serving afternoon tea featuring their housemade scones, light lunch bites and after dinner dessert in an antique filled modern urban oasis. 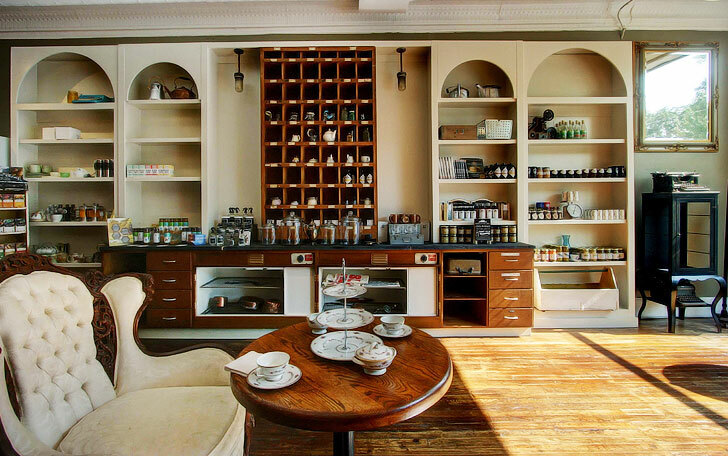 Tipple + Rose Tea Parlor and Apothecary was conceived and opened in July 2015 by musician Doria Roberts who wanted to create the ultimate urban escape. 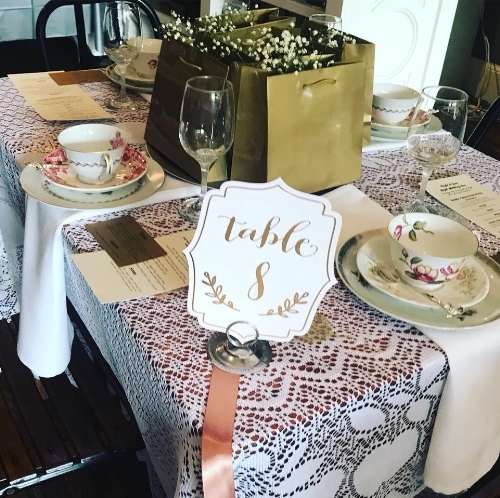 The eclectic but cozy vintage and antique filled parlor serves over 140 teas and tisanes, afternoon tea, housemade light bites for lunch, a wide array of locally made desserts and Doria's sweet and savory scones. The shop also was recently ranked third in the US by Travel + Leisure in the April 2018 issue and number one in Atlanta by EATER Atlanta..
With a focus on whole body wellness, the apothecary/retail space houses handmade and Tipple + Rose's housemade small batch bath and body products, tea making accessories, small hostess gifts and mercantile, artisanal foodstuffs, organic bulk herbs and spices and over 15 kinds of honey. 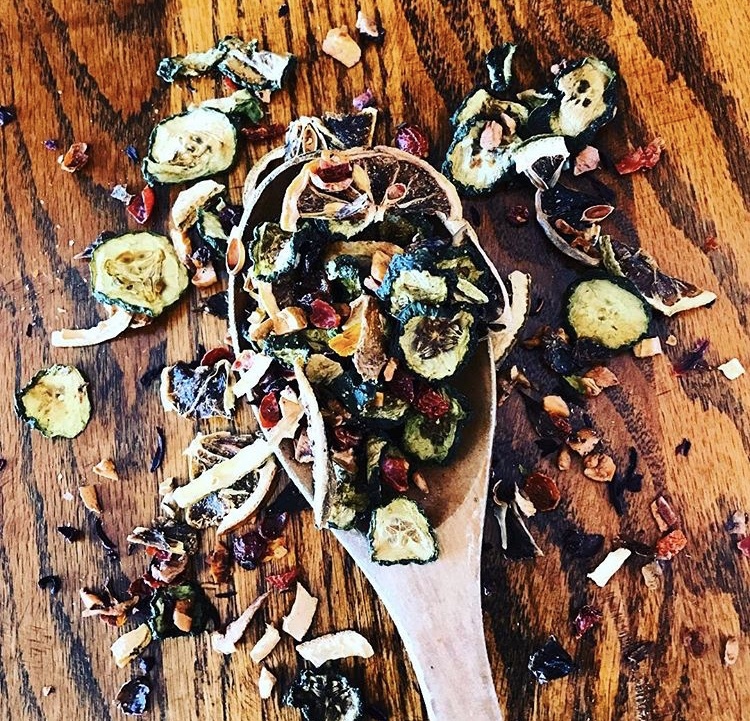 The one of a kind tea sniffing bar allows you the time and space to revel in your senses and choose the perfect blend to sit + sip or purchase by the ounce to enjoy at home. And, if you're looking for a unique gathering for your birthday, baby or bridal showers, we have you covered with perfectly curated afternoon tea parties. NOTE: Please go to the Reservation page for high tea reservations. We do not accept reservations over the phone. NOTE: Please go to the Reservation page form for high tea reservations. THE MRS. PATMORE FOR ONE - NO RESERVATION NECESSARY. Please note that We require a minimum of two adults for high tea and everyone must get the same menu for high tea unless they need the Non-Celiac Gluten Free, Vegan or Vegetarian options. Some menus are not available Gluten Free, Vegan or Vegetarian and 24-48 hours reservation advance notice is required . Please note that children under 6 years old (including infants) are not permitted at high tea. THIS MENU IS AVAILABLE AT OUR EVENT ON SATURDAY, MAY 4 ONLY. ONE SEATING AT 12:00PM. AVAILABLE VEGETARIAN OR NON-CELIAC GLUTEN FREE. SORRY, BUT IT IS NOT AVAILABLE VEGAN OR LACTOSE FREE. Please note that children (INCLUDING INFANTS) ARE NOT PERMITTED AT THIS EVENT. This menu is $40+tax per person and is available SATURDAY, APRIL 20 and SUNDAY, APRIL 21 ONLY. Apologies, but this menu is not available vegan or gluten free. Comes with your choice of our NEW Seasonal Spring/Summer tea selections and a bottle of San Pellegrino Sparkling Water. Children's Teas are available for children 6yo-10yo. Apologies, but children under 6yo are not permitted at high tea tables. With the recent birth announcement of the Duke and Duchess of Sussex (aka Meghan and Harry), we are officially on Royal Baby Watch! We’ll be offering a “Royal Baby” Baby Shower Tea Menu for your little prince or princess January - April 2019. We are currently accepting reservations for parties of 6 or more. OPTIONS: If you want to do a Gender Reveal for your guests, we can special order Pastel Pink or Pastel Blue Bread for your sandwiches. If you want to keep it neutral we can order Pastel Yellow or just use our regular white bread. We can also do a special gender reveal SCONE for an additional $3.00 per guest. We’ve also added some additional time for unwrapping gifts. INFORMATION ABOUT BOOKING LARGE PARTIES OR PRIVATE PARTIES IS ON THE FAQ PAGE. PLEASE NOTE WE have special events on May 4 and may 11 and will only be accepting reservations for those events ON THOSE DAYS. WE ARE ALSO already SOLD OUT ON SUNDAY, MAY 5TH. AFTERNOON TEA / HIGH TEA IS SERVED ON THE HALF HOUR SUNday and TUEsday WITH STARTING TIMES OF 12pm-3pm and WEDNESday through SATurday WITH STARTING TIMES of 11am-3pm. RESERVATIONS ARE REQUIRED AT LEAST 24-48 HOURS IN ADVANCE DEPENDING ON THE MENU and requests must be received before closing the previous day (6:00PM) AND BY 5:00PM ON SUNDAYS FOR TUESDAY RESERVATIONS so we can get a credit card. PLEASE DO NOT SEND YOUR CREDIT CARD NUMBER WITH THIS REQUEST. APOLOGIES, BUT WE NO LONGER ACCEPT RESERVATIONS MORE THAN 3 WEEKS IN ADVANCE AND WE DO NOT ACCEPT RESERVATIONS OVER THE PHONE FOR ANY REASON. YOU DO NOT NEED A RESERVATION TO WALK IN AND ORDER FROM THE DAILY MENU, BUT SEATING IS FIRST COME, FIRST SERVED SO THERE MAY BE A WAIT AND IT WILL NOT BE HIGH TEA SERVICE. WE DO NOT ACCEPT RESERVATIONS FOR WALK-INS. PLEASE CHOOSE ONE MENU FOR YOUR TABLE FROM THE HIGH TEA MENU PAGE. BE SURE TO FILL OUT EVERY REQUIRED SPACE. CHILDREN UNDER 6 (INCLUDING INFANTS) ARE NOT PERMITTED AT HIGH TEA TABLES. Your reservation is not confirmed until someone calls you to get a credit card on file and confirms a date + time. THANK YOU FOR YOUR REQUEST! Someone will call to get a credit card to hold your reservation in the next 24-72 hours unless your request is more than 2-3 weeks out. Please do not send your credit card via this form or e-mail. There is metered paid parking on both sides of the street in front of the shop that is FREE on Sundays and two paid parking lots on the side street next to us (Greenwood Avenue). Please check Marta.com for available public transportation routes along North Highland Avenue. If you'd like to make a high tea reservation please go to the reservation page. Please do not send reservation requests here. For all other inquiries, please fill out the form here. We offer formal tea service for parties of 2-16 guests for $25-40 per person plus tax depending on the menu you choose. Menus and the reservation request form are on our the RESERVATION REQUEST PAGE ON THIS SITE. Additionally, an 18% gratuity is added to parties of 6 or more. Please note that a party of 16 is our absolute maximum for this choice. If you have more than 16, PLEASE SEE INFORMATION BELOW. A maximum time span of 1 1/2 hours-2 hours is allotted for your group. No outside food, desserts or beverages are permitted with this option and all decorations must be confined to your tables. Please refrain from bringing glitter or confetti for decorations. If you have a party of 17-30 guests, a buy out is required for use of the space. That price is $375/hour for a minimum of 4 hours. We have one hour to close to the public, decorate and set up, two and a half hours are allotted for your event (but you are welcome to purchase additional hours at $200/hour) and then we have one hour to clean up and re-open to the public. PLEASE NOTE: ALL food, tea, tax, and gratuity are included in the buyout option price. For this option a 50% deposit is required at the time of booking. Please note that a party of 30 is our absolute maximum for this choice. Though no outside beverages are permitted, outside dessert is permitted for this option and decorations can be placed throughout the space (except for the walls). Please refrain from bringing glitter or confetti for decorations. The available times for buy outs are 2:00p, 2:30pm, and 3:00pm. Apologies, but we do not have a private room and alcohol is not permitted since we do not have a liquor license. If you’d like to proceed with either of these options, please go back to the RESERVATION REQUEST FORM to submit your request with an exact party size and a menu choice. What is High Tea? When is it served? How do I reserve? First, “High Tea” is a bit of a misnomer. The tea time Americans call “High Tea” is properly known as Afternoon Tea in Britain where it originated (or in France depending on who you ask!). But, we’ll be using the term High Tea to avoid confusion. High Tea is actually a late day meal or “supper” served at a high (tall) table and was mostly enjoyed by the working class. Afternoon Tea is also sometimes called “Low Tea” because it’s served at a low (short) table and it mostly enjoyed by the upper class..
SAVORIES Traditional tea sandwiches like cucumber arugula boursin, egg salad or smoked salmon, boursin and arugula. However, we have five different menus so please check the High Tea Menu for all choices. DIGESTIV of local sorbet and local kombucha, a fermented tea drink. CHOICE OF TEA We have a selection of over 140 teas and tisanes to choose from. It is all served on a three tiered cake stand with vintage fine china, glassware, and table linens. Our scones, pastry cream, lemon curd, and finger sandwiches are all housemade. WHEN IS HIGH TEA SERVED? The traditional time frame for Afternoon Tea/High Tea is 2:30-5:30pm, however, we serve High Tea Wednesday through Saturday starting between 11:00am-3:00pm on the half hour and on Sundays and Tuesdays with High Tea reservations starting anywhere between 12:00pm-3:00pm on the half hour. Saturdays and Sundays are our busiest days and we often sell out 5-8 days prior so please call as soon as you think you want to come in. HOW MUCH IS HIGH TEA AT TIPPLE + ROSE? 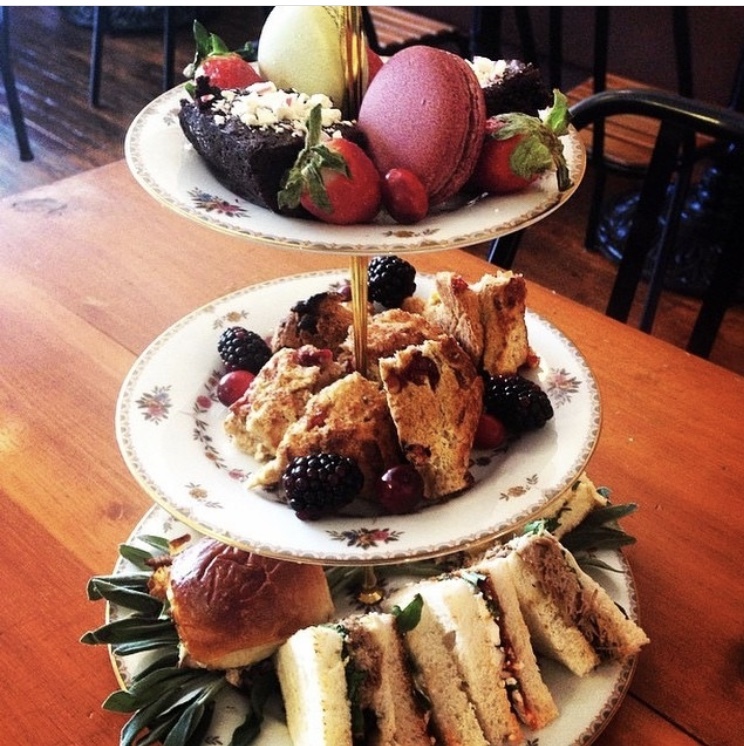 Traditional High Tea is $27.50-$45 + tax per person depending on the menu you choose. Please see the menus on the High Tea Menu page for choices. HOW DO I RESERVE MY TEA TIME? Reservations must be made via this website at least 24 hours in advance and at least 48 hours in advance for Gluten Free or Vegan requests and some specialty menu requests. Please go to our reservation request form page and fill the form. We do not accept reservation requests over the phone. What to expect during my visit? If you are coming in for high tea you will have full table service and will be sent a detailed confirmation e-mail regarding your visit. If you're a walk in customer, you will order in the back of the shop before taking a seat and we will bring your order to you and bus your table. Creamer, sugars, water, etc. is self serve in this case. While we don't permit children under 6 (including infants) at high tea, children are welcome. Children ages 6yo-10 yo can get the Children’s Menu (see High Tea Menu Page for details) Unfortunately, we do not have high chairs available and children are not permitted on the vintage furniture and should be supervised at all. times. If you are a walk in customer, seating is first come, first served and there is a one hour limit on tables from 11:00am-3:30pm on Saturdays and Sundays if you do not have a high tea reservation. There can also be a wait of 15 minutes up to an hour on the weekends if you don't have a reservation. Please note that we cannot accommodate larger parties without reservations on the weekends and we only take reservations for high tea. All upcoming events at Tipple + Rose and/or off site events sponsored by Tipple + Rose will be listed here. To follow events + get notifications about reservations, please go to the EVENTS page on http://www.Facebook.com/TippleAndRose. 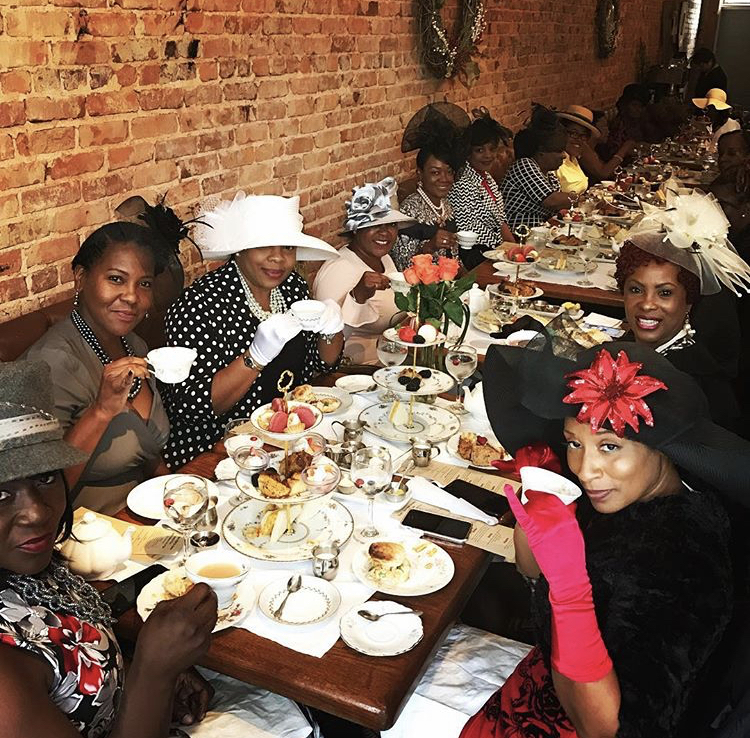 3rd ANNUAL KENTUCKY DERBY TEA! We'll be giving away trivia prizes and a High Tea For Two for Best Hat and Best Dressed so bring your A-Game! Reservations open on April 1. Menu details on the High Tea Menu page. easter weekend menu AVAILABLE APRIL 20 + APRIL 21! We’ll start accepting Easter weekend reservations on Monday, March 18. Stay tuned for menu details… A special children’s menu will be also be available. Mommy Daughter Princess Mother’s Day Tea! 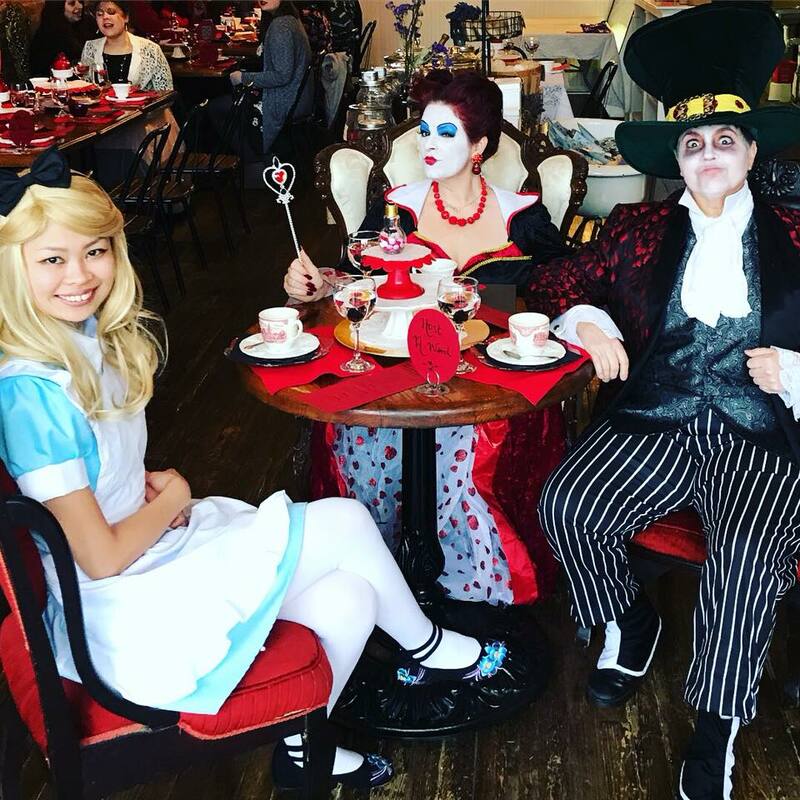 FOLLOW US ON TWITTER AND INSTAGRAM AND JOIN OUR MAILING LIST FOR ADVANCE ANNOUNCEMENTS + TICKETING FOR SPECIAL EVENTS, NEW PRODUCT AND MENU ADDITIONS, AND OUR BLOG “TEA TIME”! Browse our online shop for house blended teas and body products, tea brewing accessories, gift cards and more!